The rallies are being led by the Sudanese Professionals Association, an umbrella group of independent professional unions. 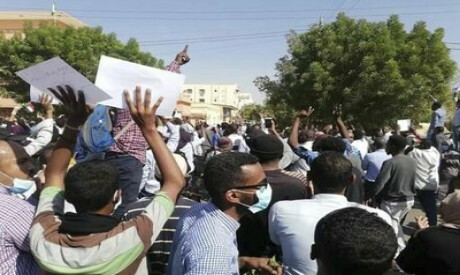 Footage posted online showed dozens of people marching in Khartoum and its twin city of Omdurman, chanting: ``Freedom, dignity and justice.'' The also canted ``the people want the fall of the regime,'' echoing the popular slogan of the 2011 Arab Spring uprisings that briefly defied despotism in the region, but never made it to Sudan. Sunday's demonstrations took place as a US congress delegation is visiting Sudan to meet with government officials and opposition leaders, ahead of the start of a second phase of dialogue between the two countries. Sudanese lawmaker Mutwakil Ahmed said in a statement the US delegation, led by Rep. Gus M. Bilirakis, a Republican from Florida, met with Salah Gosh, the head of Sudan's National Intelligence and Security Services and other officials on Saturday. The report also quoted his as saying that the recent protests ``were legitimate, but their purposes changed and became illegal.'' It did not elaborate. Mutwakil, the lawmaker, said the US delegation has discussed religious freedoms in Sudan, as well the country's counterterrorism efforts. Al-Bashir, has responded to the protests by suspending plans for constitutional amendments that would allow him to seek a new term in next year's elections. He has also stepped down as leader of the ruling party, appointing a loyalist in his place.Critics say he is trying to buy time and remain in power.